FairLifts sets up helicopter services to benefit any gas or oil operation. An array of services are available throughout the state of North Dakota. Services include helping with emergency needs, leak detection, shipping necessary cargo, and aiding in the transportation of crew members. All of FairLifts services are customizable so you can get exactly what you need. Our aerial services are performed by certified crew members and pilots that are connected to FairLifts in North Dakota. There are a total of 17 counties in North Dakota that produce oil and gas. Over 1.2 million barrels of oil were produced each day in the state in July 2018. This is up over 21% from a year ago. 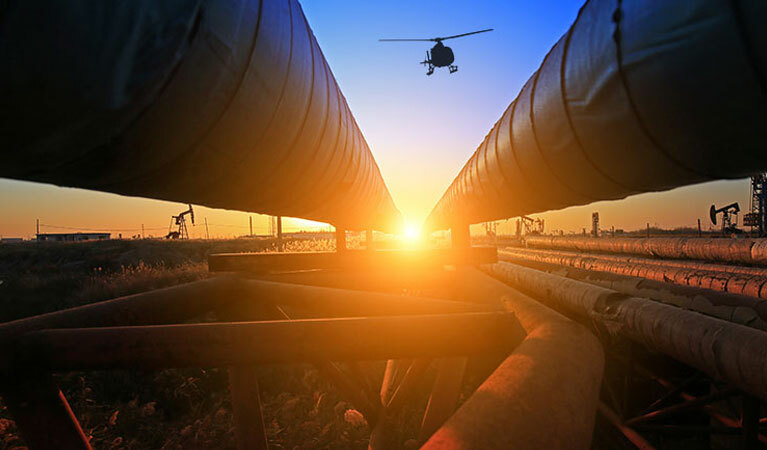 While it is true, about 94.7% of the oil and gas stems from four western counties, there is still a lot a helicopter can do to benefit these oil and gas operations, including providing necessary inspections. FairLifts reserves helicopter services throughout the entire state of North Dakota. Local vendors use the latest in helicopter technology to deliver quality pipeline surveys. Technology used can include LIDAR—which provides graphic 3-D terrain images—to bring you exactly what you need. The Pipeline and Hazardous Material Safety Administration (PHMSA) mandates pipeline inspections, meaning often times they are required to meet federal laws. FairLifts pipeline services are completely customizable to meet your needs. Discover more about your helicopter service options by reading below. Inspecting a pipeline is an important part of any gas or oil operation—oftentimes an even federally mandated part. FairLifts can arrange the pipeline inspection you need. The view from above provides a more accurate depiction of a pipeline; our vendors use the latest technology as well. If you have cargo shipping needs a helicopter can help out. A helicopter has the ability to lift cargo—no matter how heavy—and deliver the cargo to exactly where it needs to go. The plus side is it takes less time through the air than on the ground. A helicopter can assist in early leak detection. This is extremely important for environmental reasons and for profit. Once a leak is detected a helicopter can help by providing emergency services and in transporting necessary crew members to fix the leak as quickly as possible. Unsurprisingly, a helicopter can help get you and your crew members anywhere they need to go. A helicopter flies in a precise manner, making it possible to fly crew members over difficult terrain or difficult to reach locations—including bodies of water—in no time at all. FairLifts helps out many gas and oil operations throughout North Dakota with aerial pipeline insprctions. Helicopter services can easily be arranged to help with your operations, enabling you to perform tasks quicker, require less manual labor, and help ship cargo. A team member is standing by ready to answer any questions you may have or to get started on your quote. Because we believe in convenience, we have our lines open 24/7 each day. Our vast network of helicopter pilots and crew make setting up any of our services a breeze. Amidon - Ashley - Beach - Bismarck - Bottineau - Bowbells - Bowman - Cando - Carrington - Carson - Cavalier - Center - Cooperstown - Crosby - Devils Lake - Dickinson - Ellendale - Fargo - Fessenden - Finley - Forman - Fort Yates - Grafton - Grand Forks - Hettinger - Hillsboro - Jamestown - Lakota - LaMoure - Langdon - Linton - Lisbon - Mandan - Manning - McClusky - Medora - Minnewaukan - Minot - Mohall - Mott - Napoleon - New Rockford - Rolla - Rugby - Stanley - Stanton - Steele - Towner - Valley City - Wahpeton - Washburn - Watford City - Williston, and more.